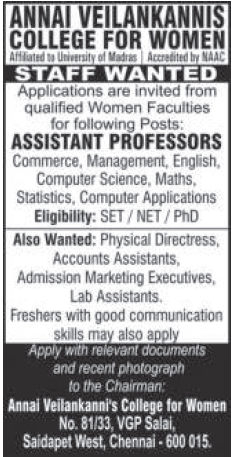 Annai Veilankanni's College for Women, Chennai has advertised in THE HINDU newspaper for recruitment of Teaching Faculty- Assistant Professor Plus Non-Faculty jobs vacancies. Interested and eligible job aspirants are requested to apply as soon as possible from 24th March 2019. Check out further more details below. About College: Annai Veilankanni’s Educational and Cultural Society is founded by Dr.S.Devaraj, in the year 1988, and has progressed steadily in its pursuit of excellence. The vision of the Society, is to start a group of educational institutions which would provide the means for aspiring students to get good quality education starting from schooling right through graduate and post – graduate courses. PG with NET / SLET / Ph.D.